I found SU's Three for You punch box set very intimidating at first, but I've been having so much fun with it now. 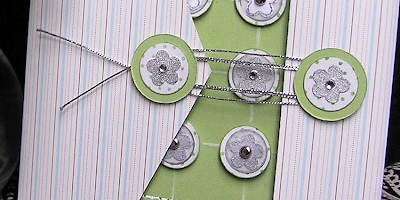 (Gotta get my money's worth) ;0) I used it to make homemade flower stickers for this card. I wanted to use that perty lined paper (SU's Notecard designer series paper) but I didn't have enough left for a regular envelope. Then I didn't have enough for even a belly-band-elope... so I used a piece of certain celery cardstock as the back and..
...Cut the triangle by measuring & marking each side at the same place (in pencil) and then marking the center. That let me use my design ruler to connect the dots. ...placed the triangle over my card to see where I wanted it to lay. Scored along the card edge underneath (just with my fingernail) & folded it. The closure is just 1 inch circles in Certain Celery with more of the Wild Wasabi stamped Naturals c.s. 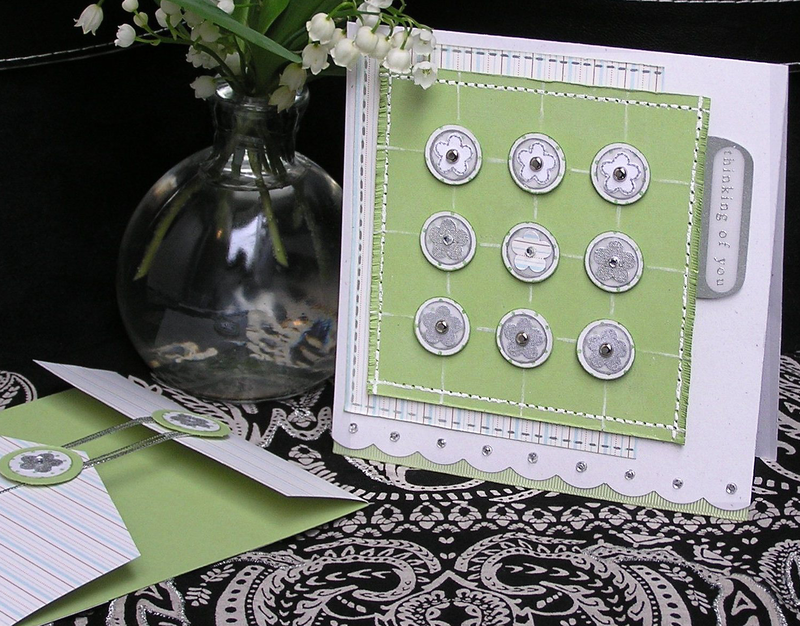 circles & 2 of the silver fabric stickers. The Dimensionals let the silver cord sit against them & that holds it together. The ribbon on the bottom is just stuck on with a line of double-sided tape. It's by Stampin' Up! (Certain Celery 5/8" grosgrain) & I was surprised that it's sturdy enough to stand this way. P.S. 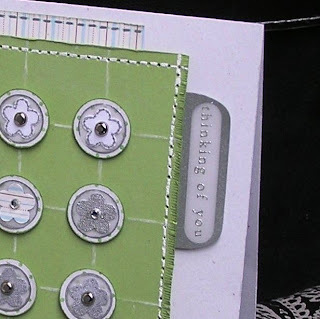 For more on the faux grid technique used on this card and some paper piercing ticks please visit this post. WOW! You are amazing! How do you sleep? Your brain must be working 24/7 in order to come up with these awesome, creative ideas! I love this! Gorgeous! Gosh, Mel! Your card is so pretty! I love the elegant look to your cards! I also love your backdrops. . .such pretty arrangements. . .it matches your cards so nicely!! You always come up with such great ideas! I love how you step out of the box all the time. Your cards are so unique. 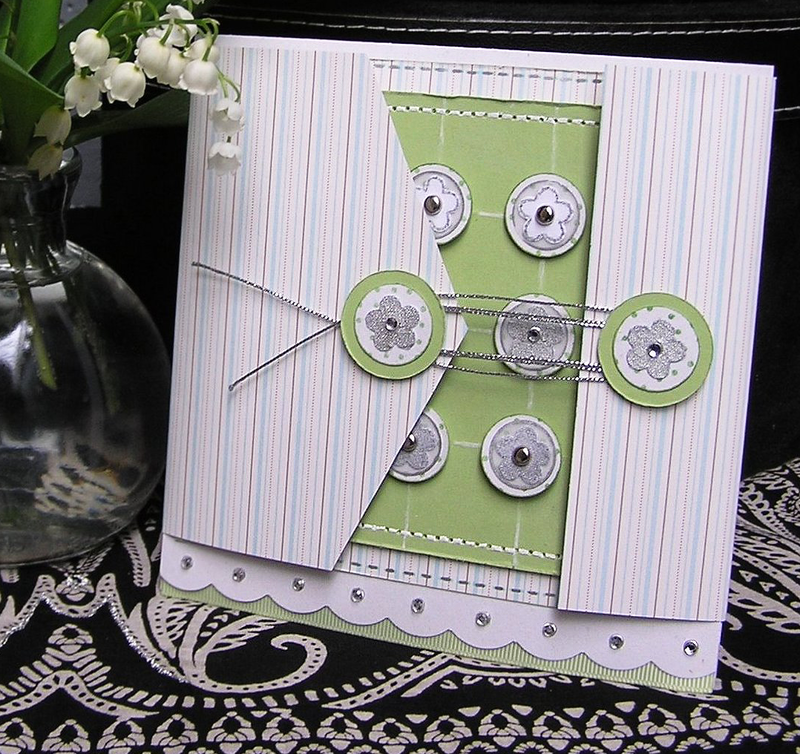 Keep up the great job on your cards as well as your blog!! I love this....the color scheme, the little stickers, just all of it!